The major advantage of selling a website is the sheer reach available to sellers. The poor coffee shop owner is restricted to selling to someone in the neighbourhood. You can reach the Outer Hebrides. And the following listing locations are the main places for selling websites. Update: The biggest forum for website buyers is now accepting website for sale listings and it's 100% free. Click here to list your website. Probably the best known are BusinessesForSale.com, Daltons Business and Sunbelt Network. Most of them have syndication agreements with various outlets and your ad is likely to appear on more than just the one listings website. Some of them even send the details out to their database of waiting buyers. There is usually a fee involved to list on these sites. 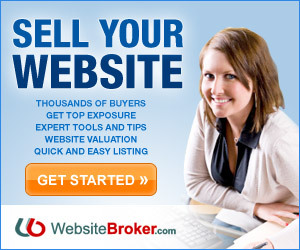 But read the advice here before hiring a broker to assist with selling your business on these sites. If you're looking to sell a $100 website then these are obviously not the right places. Sites and businesses for sale on these large listing sites typically range from the low five figures to several millions of pounds/dollars/U-rue. For sites under $10K the webmaster forums below are probably a better bet. BizBuySell.com also has a fair few of the six-figure-and-above web businesses. Costs of $45 and $75 for standard and premium listings. Your listing stay live for two months. Business-sale.com lists UK businesses selling for over £250,000. Listing is free for three months if you sign up for their newsletter. Website Brokers: More recently, several smaller broker firms have appeared and they specialise in the sale of lower value websites. Their typical offering could be anywhere from about $10K to a few hundred thousand dollars. Some examples: FlippingEnterprises, Quiet Light Brokerage, We Sell Your Site. Tip: When using a broker make sure the broker is working for you, not the buyer. His commission being a percentage of the sale fee is an incentive but in itself not sufficient protection. Read our article: Making your broker earn his commission. eBay: eBay is, of course, a good place to sell anything. With businesses and websites worth $30K+ however eBay is a tricky market. You'll need to bear in mind that prospective buyers have spent a lot of time weeding out templates, cookie cutters, various get rich quick schemes and more than the odd con. They're reading your auction with some degree of wariness and it'll be up to you to build the trust required to close the sale. Various webmaster forums are good locations. Don't forget to read our top ten tips to make the most of your forum listing and maximise your sale price. Sitepoint (now Flippa.com) used to charge up to $40 for their most expensive listing but now charge a flat $19 but take a percentage of the final sale price as a "success fee" if you achieve a sale. The success fee is capped at $499. There are other charges to give your listing prominence by making it bold, showing it on the front page etc. It may be worth it if you expect your site to sell for anywhere from $100 to about $30K. Links to online auctions or external pages advertising your site for sale are not permitted. You are not allowed to simultaneously list your site elsewhere if it's listed here. There's often a problem with non-paying bidders on Flippa (which still leaves you liable for the success fee). Unlike with other forums, you have control over comments and can delete comments in your Sale Thread that you do not approve of. Our site provided the website valuation guide on Sitepoint and the How to Sell Your Site Guide. The Website Brokers further up the page offer an alternative to Flippa and may be worth trying especially as they charge based on results. Search Engine Forums: Part of the big Jim's World webmaster forums. Was down for a year or so, was moved and is now active again. No Pr0n, casino, gaming or spammy sites allowed. Wanted ads welcome. No charge for listing. Our site provided the official guides on this forum. Digital Point: This forum has become very active very quickly. Hosts both WTB and Site For Sale posts. No charge for posting. The rules are more relaxed here than at some other forums and the moderation less rigid. 1000 PM limit so ample for most users. Probably the best bet for most lower value sites for sale. But a listing could quickly get lost here with the sheer volume of posts/threads on the average day. Accepts listings for adult sites. WHT: Web Hosting Talk is, as the name suggests, not really a site dedicated to selling and buying businesses. However, the link leads you to a section on their forum where a lot of sites do sell. These tend to be sites costing under $10,000 with most of them under $2,000. Free to list your site or post a WTB (Want to Buy). Geek Village: They definitely don't like adult sites here. Posts limited to one free post every 30 days. Generally for sites worth less than $10,000. WTB allowed. Free listing. Webmaster Talk: Not as active as the others, but still worth a shot. It's a free listing for sale or purchase. Domain State: Little known but at least as good as one or two of the others above. Free listing. DNForum: This is a paid forum and the focus is more on domains than on websites. But, complete sites do sell here. Tip: You could save on the membership costs by buying DNF membership elsewhere. WHT (above) often has threads where people sell their "spare" memberships. Browse through there for a few days and you are bound to find one. DNF does allow adult sites to be listed but you'll have to be discreet in your wording of the title and the post. Website Broker: Not a forum, just a marketplace. Has sites for sale listed by category so easy for buyers to browse. The fact that it charges for listings reduces the noise. The standard format offerings are presented in makes for easier comparisons across sites. At any given time it seems to have a fair few listings. Sitebazaar (now not operational): Like the webmaster forums Sitebazaar generally has the lower priced sites and has a basic search feature. The few categories offered include Adult, Sport and General. The site allows you to search for sub $1000, sub $10K and above $10K. Hotscripts is worth visiting if the main asset on your site is the script/program/code behind it. Sitepoint also has a Scripts and Software forum. Site Owners Forum (now no listings): A newer forum without the member base that some of the others have. Performancing: Listing of blogs for sale. Still very basic and yet to gain traction. Not many listings. Sedo: One of the best known places for the sale and purchase of domains (not sites). Others are Namepros and Afternic. They use their own, very good, internal escrow. Business forums (like Aardvark), and pretty much any other community of webmasters like V7N, a forum fast gaining popularity. Daniweb: A developer forum so may be more suited to sites and domains of a particular nature. You need to scroll and scroll and scroll past the ads on every page before you hit content. Last and least: Loot, Craigslist and other local classifieds. Note that in Loot, for example, you don't want the "Internet Services and Equipment" section under "Businesses and Loans" but the "Opportunities" section. I would have given you a link direct to the relevant page if it wasn't for their less than inspired navigation/URLs - you just can't link to them! Loot wouldn't be my first choice and I wouldn't list a site in there at all unless it happened to cater for people in a small geographical area (as Loot readers are generally looking for something in their backyard). Important tips to make the most of your forum listing. Since adult content comprises so much of the internet and most forums don't allow the sale or listing of adult sites, it would be remiss to not point out at least one location specialising in over 18 content (in addition to the ones above described as accepting adult sites): go*uckyourself.com. It has an active site buying and selling section. The asterisk is, of course, to mask the world's favourite "F" expletive. Other "adult" webmaster forums, like just7blow8me dot com (remove the numbers) do also allow listings as do Craigslist, Kijiji and eBay (but you need to read the fine print first). Put a notice on your site itself. Create a page, put as much information you feel comfortable disclosing and stick a form on there for interested parties to contact you to find out more. You could maybe even get them to agree to your Non Disclosure Agreement (link coming) as part of the form. If you don't want your usual visitors to see it don't link to that page from your homepage. You can give it an obscure link from the bottom of your sitemap or some other rarely visited page and search engine spiders will find the Sale page. If confidentiality is really, really important don't list it on the site at all (as it could come up in a search for "Site:www.yoursite.com" i.e. a search that lists all the pages on your site). Ask a friend to host your page for you. What words would someone looking for a site try in their favourite search engine? "Site for sale", "Want to buy a site", "Buy websites"? Or they may try to search on phrases that sellers are likely to have used: "This site for sale", "Buy this site", "Selling this site". Optimise for those.